For once, we’re against destruction! Okay, we’ll admit it. One of our favourite past times at Metal Potato is destroying things. We love tearing down old websites, we love destroying outdated work and we occasionally love destroying random objects by dropping them from the roof of our building. But, whatever. 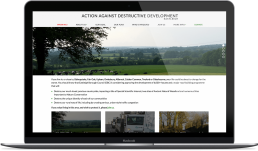 When ADD Eastleigh (Action Against Destructive Development) approached us about a website, we decided to lend a hand. The movement focuses not on destroying things, but on preserving them; on preserving the Eastleigh countryside in the face of corporate development and the invasion of some 6,000 homes to the area. Current residents are, of course, against the destruction of their peaceful way of life, and they’ve taken to the internet to drum up interest for that cause. By taking this project on, it became our duty to build a modern, responsive website that delivers ADD Eastleigh’s message quickly and effectively, that puts the power of the internet to use in the hands of England’s rural citizens. It’s no exaggeration to say that a people’s way of life is on the line here. 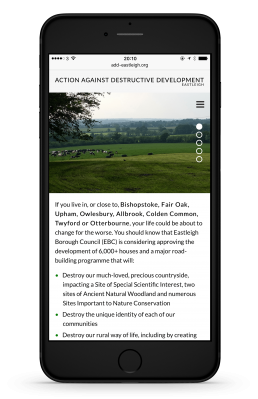 We worked with ADD Eastleigh step-by-step to import their own custom content into a modern layout that gives them a fighting chance to raise awareness for their cause and stop the destruction of the Eastleigh countryside. That’s the kind of cause that we can get behind, and it’s one we’re pleased to have seen through to completion. I wanted to set up a website for a local campaign and, as I had not done this kind of thing before, needed all the help and support I could find. Metal Potato gave that to me in spades. Helping me through every step of the way – no question was too small – they produced a website we are delighted with, and trained us brilliantly in how to keep it updated. I would not hesitate to recommend Metal Potato for your website needs. Professional, personable, reliable, patient and responsive, I give them 10 out of 10.